I've been a member of a credit union since I was in college. I used the account for a couple of years and then moved my money to a "for profit" bank due to the convenience of multiple branches and ATM machines around my city. I didn't close the account and kept it open with the minimum balance of $5 as required. When I purchased my first home, I totally forgot about my credit union membership so I didn't apply to them for a mortgage loan. I probably could have got a lower interest rate. There is a credit union that is close to my house that I've wanted to join for a few years but I didn't meet the eligibility requirements. They recently changed their membership requirements to include residents of certain counties. Luckily, I now qualify for membership. I will be going there a little later today to open an account. I'll still keep my account at The Behemoth Bank to make deposits when I can't make it to the bank during branch hours. I like being able to make a deposit at the ATM and get a picture of the check printed on my receipt. If the credit union offered this service, I would close the account at The Behemoth Bank for good. Credit unions are usually owned and operated by the members so the credit unions earnings are returned to the members in the form of higher dividends (interest). Not sure if you are eligible to join credit union? Visit this site to determine what credit unions you are eligible for in your area. Are you currently a member of a credit union? Is the service you receive better than a regular bank? I was not a member of a credit union until recently, but joined to get a much lower rate on my mortgage. I really don't use it that much for anything else, ING takes care of direct deposits and moving money around. But when I get an actual check I will take it there. I've thought about it. 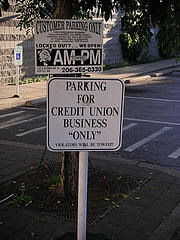 Right now there aren't any easily available credit unions near us. Whereas Wachovia's pretty convenient. However, I'm going to look for them when we move. We'll also use ING for a lot, but brick and mortar can be handy. We are members of our state employees credit union, and get great interest rates on ALL our accts and low to no fees. There are plenty of branches and ATMs we can use around. We aren't State employees but my dh's parents were, and I believe that is where our eligibility comes from. I've also had great customer service there! Much better than any other bank I've been with.